Updated Monday April 8, 2019 by Office. Open to players of all levels. Weekly Sessions and Summer Camp Options! What types of players are we striving to develop? 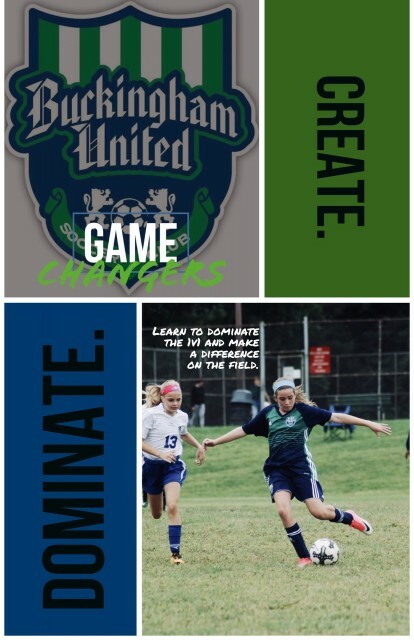 At Buckingham United / CBAA Soccer, our goal is to develop creative, skillful, dynamic players that can influence matches on a regular basis by solving problems. We want exciting, risk-taking, difference-makers on the ball that can make something out of nothing and keep fans on the edge of their seats. What qualities do our players need? Our players will be comfortable in and be able to dominate all of the different 1v1 situations that take place over the course of the match: with a defender in front, a defender behind, defender on the side, and defender on an angle. By being a 360° player, our players will be versatile and able to impact matches from multiple positions. How do we develop these players? Our curriculum is a progression of concepts that influence the key moments of the match with a heavy emphasis on technique. The variety of techniques that a player is able to execute ultimately determines their potential. A player that has more options to solve a problem is likely to be more successful in doing so. Dynamic players have numerous moves and turns that allow them to dictate where they go with the ball. Our goal is to educate players on the difference situations that they face throughout a match and through coaching and repetition, improve their confidence and ability to dominate opponents. By being able to take players on consistently, our players will quickly become the game-changers on their team.